There's a lot to love and a lot that doesn't work in this radical new adaptation of the Snow White fairy-tale from debut feature director Rupert Sanders. The stuff to love centres around the characterisation of the wicked stepmother, Ravenna. She's written and played as a deeply insecure, emotionally scarred woman who has had to use her beauty to survive in a misogynistic patriarchy where women are sold as chattel and discarded when their looks fade. There's a superb scene early on, when she's addressing the mirror on the wall, where we move to the perspective of her brother, and we're not sure if the Queen is just imagining it all. Charlize Theron is absolutely stunning in the role - both in terms of the costume design and her performance. And fans of Games of Thrones will forever regret that she wasn't given the role of Cersei Lannister, more of which later. I was so involved in the story of Ravenna, that in the movie's final battle scene, I was willing her to win. She reminded me of Edmund in Lear, with his radical, demonic argument for meritocracy against the old established order. Other things to love in this movie? As one might expect given Sanders background in commercials, the visuals are beautifully shot. Indeed, one of the strengths and weaknesses of the film is that the narrative often feels like a weak excuse to get us from one beautifully imagined background to another. The motivations for the moves, the narrative drive, seems secondary to the indulgently imagined costumes and scenery. The tragedy is that all this beauty and Theron's wonderful performance is wasted upon a movie that is poorly paced, and plays like a second-class echo of better imagined fantasy worlds, created by George R R Martin, C S Lewis and Tolkien. The character of Ravenna, complete with her incestuous relationship with her brother Finn (a marvellously creepy Sam Spruell) is straight out of House Lannister. As is the visual use of sigils and banner-men. Snow White's long journey through different worlds before she finally faces off against Ravenna is straight out of the Lord of the Rings, with the dwarves recast as hobbits and Bob Hoskins' blind seer as Gandalf. And finally, Snow White (Kristen Stewart) has been recast as an Aslan like figure, reciting the Lord's Prayer in full (surely a first for modern teen cinema? ), exhibiting healing powers over man and nature, and finally not even sealing the denouement with a kiss - rather standing alone, in power, neuter, a Virgin Queen. This, of course, brings us to the weakest aspect of the film - its romantic core. Stewart's resentful mopey screen persona is ill-fitted to an active, action heroine who must imspire a people to revolt. 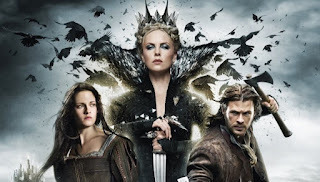 Chris Hemsworth as the Huntsman is more charismatic but suffers from an unhappy attempt at a Scottish (?) accent. It's not as bad as Russell Crowe's attempt at regional English in ROBIN HOOD, but it's still unfortunately reminiscent of Mike Myers in SHREK. Still, the two young actors have a convincing rapport, which is more than can be said for Snow White and her aristocratic childhood sweetheart William (Sam Claflin).Claflin's character is so thinly written - his performance so uninspired - the potential love triangle so quickly dismissed - that what should be a powerful love story is reduced to a whimper. One can only conclude that the movie is irredeemably let down by a poor script from Evan Daugherty, John Lee Hancock - THE BLIND SIDE, and Hossein Amini - DRIVE. It's just too derivative, too thinly developed, too lacking in narrative drive. And worst of all, they try to include an emotionally manipulative death scene that's utterly unearned. P.S. Why does no-one wear helmets in battle? Stannis Baratheon I'm looking at you. SNOW WHITE AND THE HUNTSMAN is on release everywhere except: Cambodia, Denmark, the Netherlands, Ukraine, Finland, India, Norway and Sweden, where it opens on June 8th; Belgium, France, Switzerland, Russia and Japan where it opens on June 13th; in Australia, New Caledonia and New Zealand where it opens on June 21st and in Italy where it opens on July 11th.